In honor (or anguish) of the scorching heat wave we’ve been experiencing these last couple days, this Tuesday is all about sweet floral inspirations. Weather you’re hosting a BBQ or traveling to the beach, these sweet treats are sure to brighten your day and leave you with a better taste of nature. Edible flowers can have a longer shelf-life than you may think. 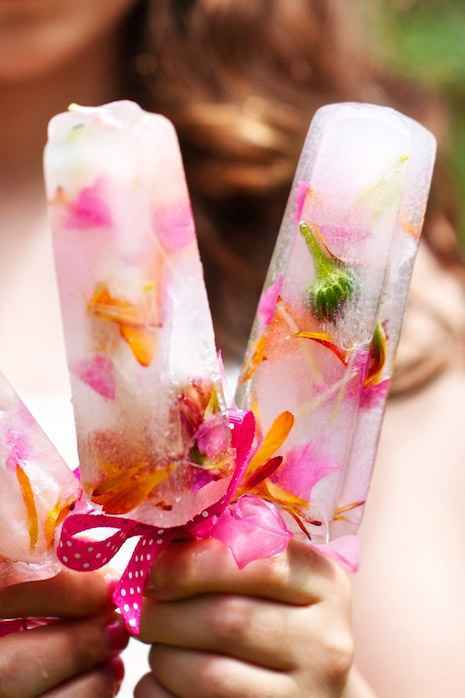 By painting the petals with an egg-white wash or another one of these simple recipes, they can be refrigerated for two weeks or frozen up to six weeks. Most chefs recommended using a soft brush and choosing flowers with larger petals, like pansies. After painting, dust the petals with super-fine granulated sugar and dry it. Store preserved flowers in an airtight container in a cool, dark place. Avoid dark-colored petals as they turn even darker with this treatment. For cocktails and desserts, use sweeter blooms like violet, rose, or lemon verbena petals. Spicier petals like garlic, rosemary, nasturtium or chive flowers are better for savory dishes. Whenever you use edible flowers, it’s important to make sure that they are in fact edible, meaning that they aren’t poisonous or grown with pesticides. The flowers of most culinary herbs are safe, but you have to be careful when purchasing them from random garden centers or nurseries because many of them aren’t grown for consumption.